This works really well as a starter portion for 6 people. Make sure you use top quality fresh extra virgin olive oil from the most recent vintage. We buy fresh olive oil made by the Tuscan wineries Capezzana and Selvepiana. They’re not cheap but they taste fabulous when only the best olive oil will do. Wine Suggestion: The iron rich Cavolo Nero requires something minerally and iron rich too, but you need to avoid wines with too much weight. We’d suggest trying the Gulfi Cerasuolo di Vittoria, a red from Sicily that is a blend of Frappatto and Nero d’Avola which combines an earthiness and power with a joyful fruit and fresh acidity giving the wine personality and depth without excess weight. Remove the stalks from the cavolo nero but keep the leaves whole. Blanch the leaves in a generous amount of boiling salted water along with 2 of the garlic cloves for just a few minutes. 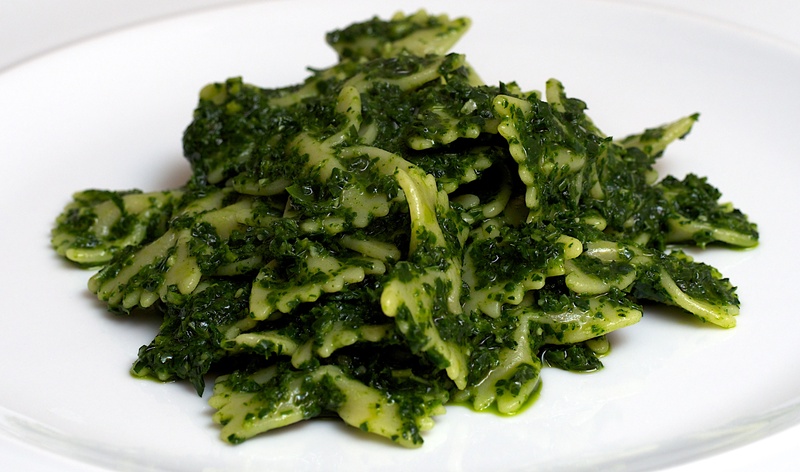 Put the blanched garlic and cavolo nero in a food processor and pulse to a coarse purée. In the last few seconds, pour in around 75ml of the oil to make a fairly liquid purée. Crush the rest of the garlic with 1 tsp sea salt and stir into the purée with another 75ml of oil. Season to taste. Cook the the farfalle in plenty of salted water, then drain. Add the pasta to the purée and stir until evenly coated. Pour in the remaining olive oil and serve with some grated Parmesan. I love the color of this dish. Looks delish!